K.F. Electrical was started in 1996, after working for 20 years for Norweb (regional electricity board). 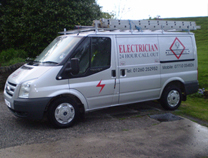 We are a small family run business, with seven trusted employees, who are all qualified electricians. We are a member of NICEIC as approved contractor and registered as a NICEIC domestic installer. We are also proud to be a member of the trustmark scheme which is an award-winning scheme supported by Government, building industry and consumer protection groups to help you find reliable, trustworthy tradesmen to make improvements and repairs inside and outside your home. We take great pride in our excellent quality of work, competitive pricing and accurate, honest advice to all our customers. We are always available for your questions so please do contact us stating your requirements and needs if you would like a reliable quote. We can offer a wide range of services with 24 hour emergency call out.